Sidney Richard Williams, called Percy, was born in 1821 in London, as the fifth son of English landscape painter Edward "Old" Williams. 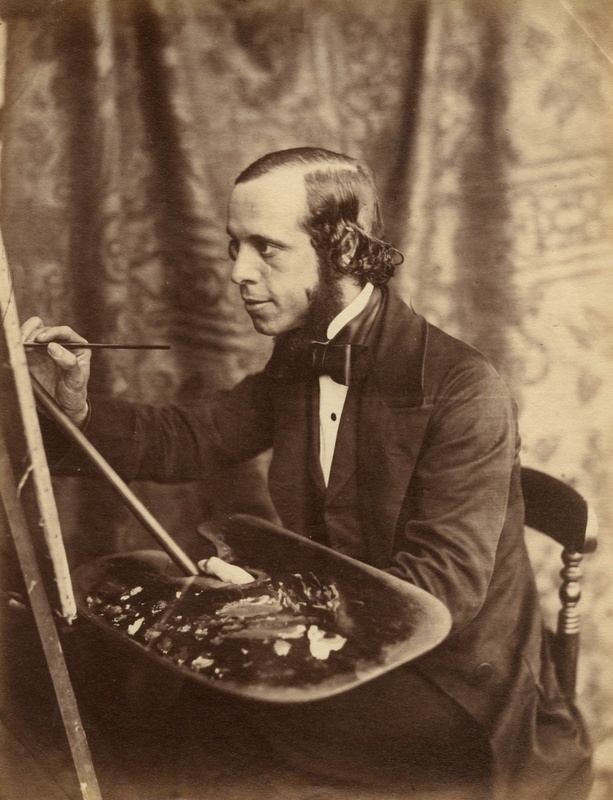 He had five all brothers, all of whom became landscape painters, and though born Williams he changed his surname to Percy to disitinguish his art from that of the rest of his family. 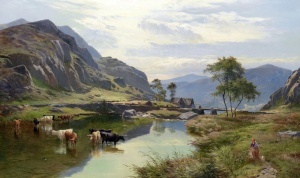 Sidney Richard quickly established himself as one of the leading landscape artists in Britain, and his work was much sought after in his own lifetime. His most famous patron was perhaps the Queen Consort Prince Albert, who viewed Percy's painting of Llyn Dulyn, North Wales on exhibit in 1854 at the Royal Academy. The prince subsequently purchased the painting and presented it to Queen Victoria that same year on Albert's own birthday of August 26. 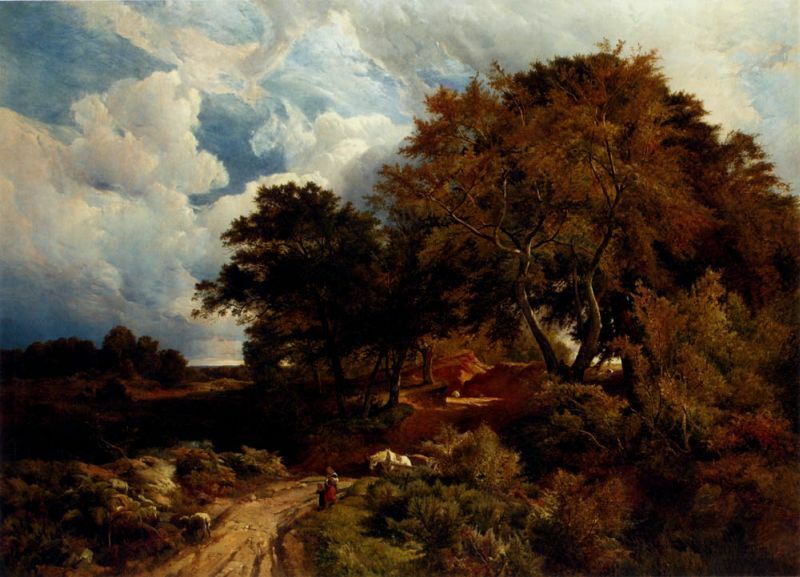 This painting is still in the Royal Collection and can be viewed in Osborne House on the Isle of Wight. When queried at his house on Mulgrave Road, Sutton Parish, Surrey during the 1881 Census of England he gave his occupation simply as "landscape painter". 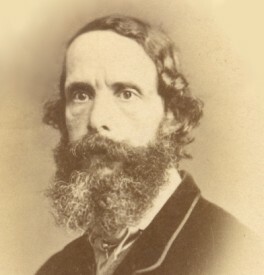 He also occasionally illustrated books, including detailed drawings of rocks for the writings of the celebrated geologist Sir Frederick Murchison. 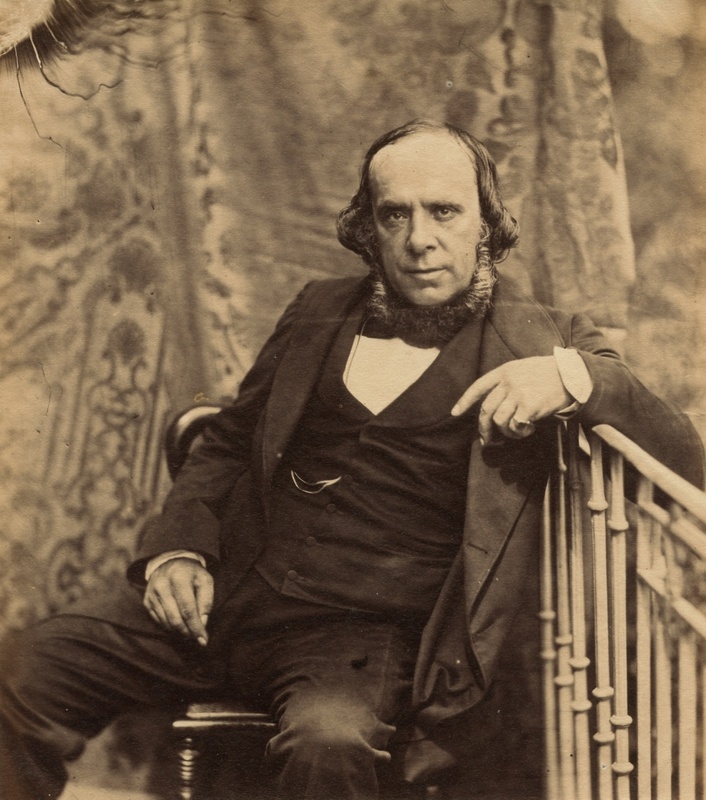 The paintings of Sidney Richard Percy were displayed, one posthumously, from 1842 to 1886 (215 paintings) at all the major exhibitions of his day, including the Royal Academy (73 paintings), the Suffolk Street Gallery of the Royal Association of British Artists (77 paintings), and the British Institution (48 paintings). 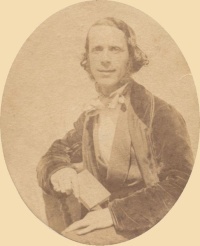 Sidney Richard Percy died prematurely on April 16, 1886 at Woodseat in Sutton, Surrey, due to complications of a horse riding accident, in which his leg had to be amputated. 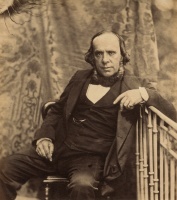 Today, examples of his work can be seen in several museums and galleries, some of which are listed below. 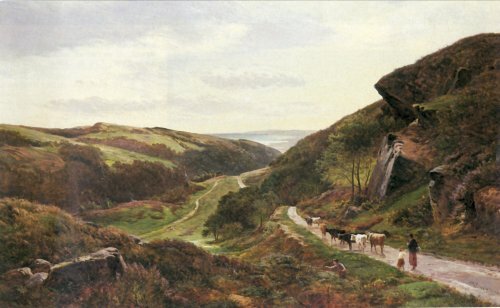 Though undated this almost is almost certainly one of Percy's earlier paintings. Note the crudeness of the cows and people compared to his later works. 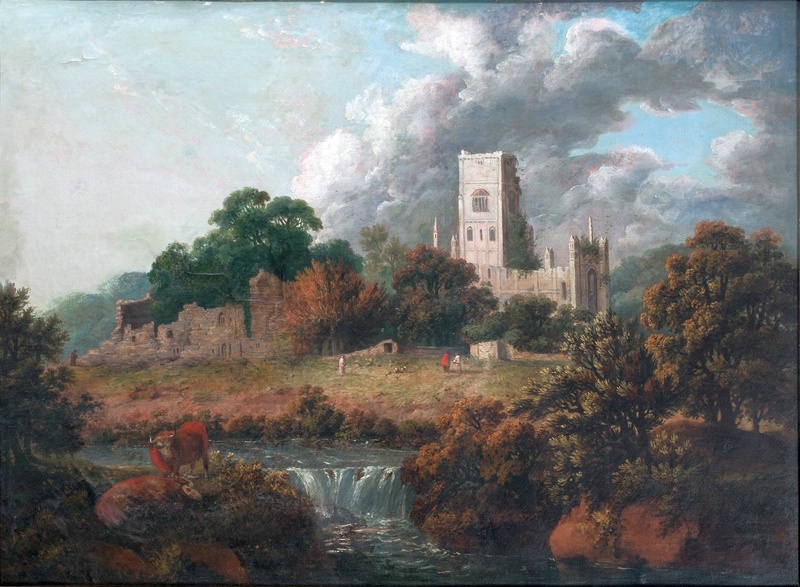 Also, the main subject is architectural with two buildings - one in ruins and one new, and both partially obscured by trees. His later works typically emphasized cows in open pastures and meadows with mountain backgrounds draped in clouds. 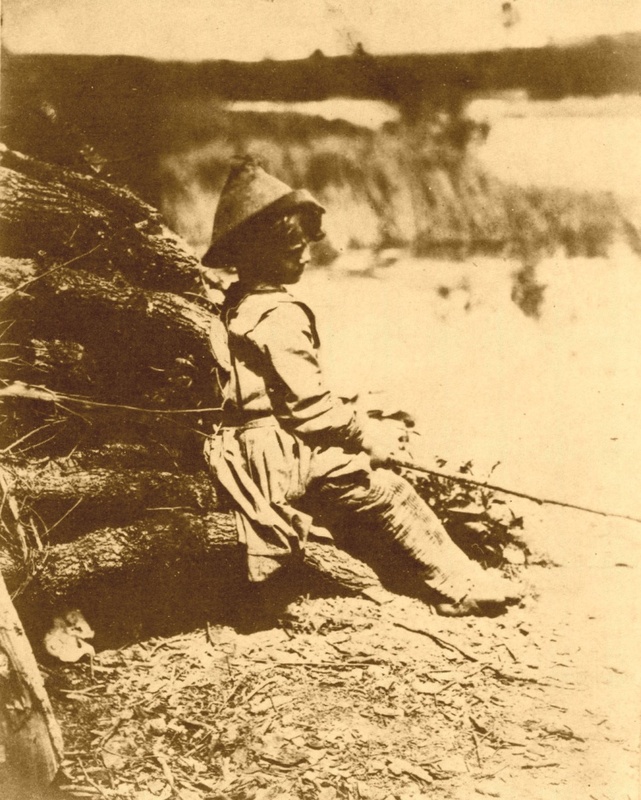 Lastly, the Thames River setting indicates an early period in Percy's career when he was still being mentored by his father and older brothers. 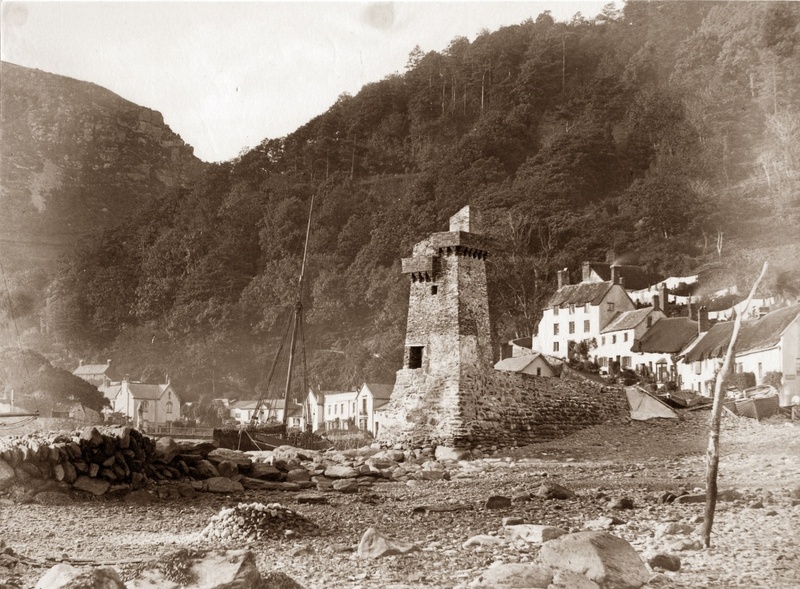 He would move on as he got older to scenes northern England, Wales and Scotland. 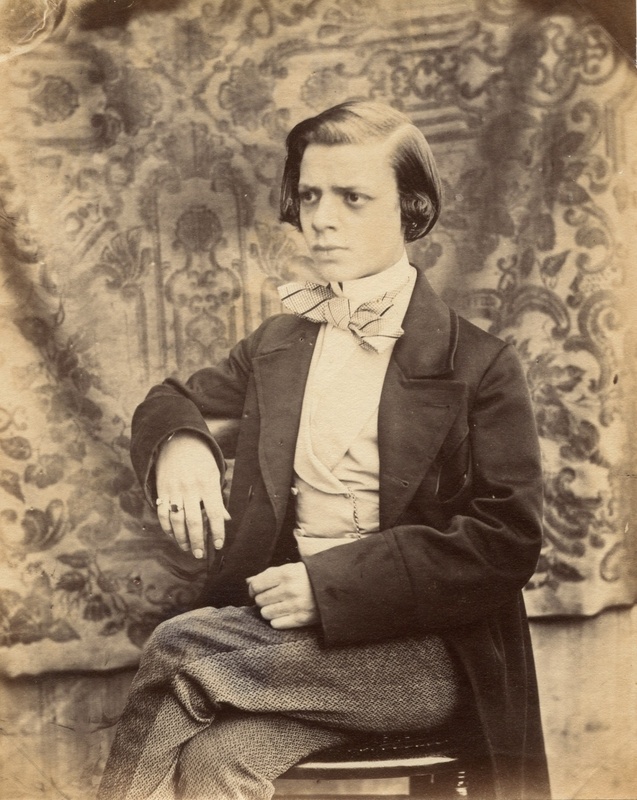 Sidney Richard Percy began exhibiting his works in major exhibitions as early as 1842. 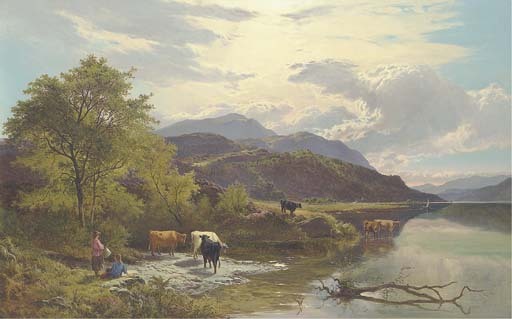 This early work of his was painted in 1845 when he was about 24 years old, and it is very similar to in theme and execution to something that his older brother and mentor Henry John Boddington might have painted. 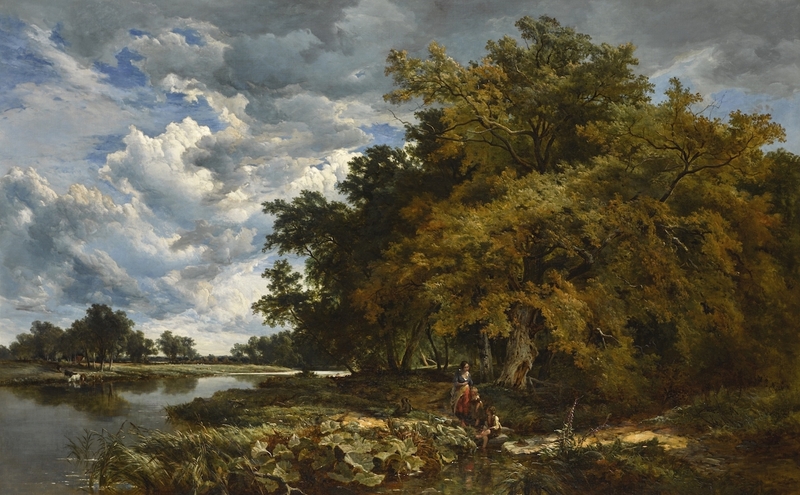 A painting very similar in theme and execution to the above work, but with more clouds. Another early painting. It lacks the symmetry that would come to characterize his later works, but it does feature the cows that he later became famous for. 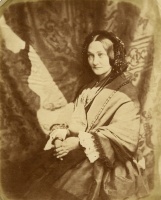 Exhibited in 1852 as entry no. 1311 at the Royal Academy of Art, this scene of a horse on a backcountry road is not the typical Sidney Richard Percy painting, and shares elements found in many paintings by his older brother Henry John Boddington. Another early Sidney Richard Percy landscape, but one that shows elements similar to paintings by his older brother Arthur Gilbert - dark colors, earth tones, and few if any figures, trees, or animals cluttering up the landscape. This is a transitional painting that shows elements of both Henry Boddington and Arthur Gilbert, but also shows some of the features that came to characterize Sidney Richard Percy's paintings of the 1860s and 1870s. 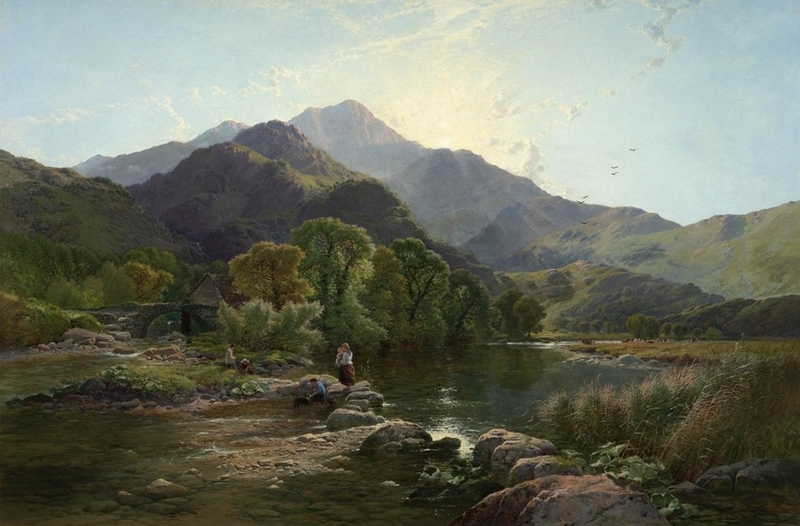 The stark mountain landscape and the dark tones speak to Gilbert's style, whereas the sunlight shining through the clouds and reflecting off the water speaks to Boddington. However, the cows in the foreground and the symmetry of the work are classic Percy. This is an important painting in Sidney Richard Percy's career, but as it is in a private collection, we do not have a color image for it. 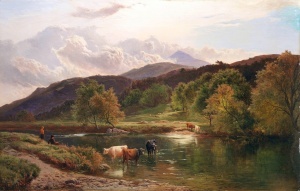 This was one of the first paintings for which he received widespread accolades, and he repeated its successful theme of "cows and clouds" often in the years to come. As such, it set the stage for the style and theme for which he is best known. 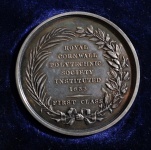 It was displayed in 1856 as entry No. 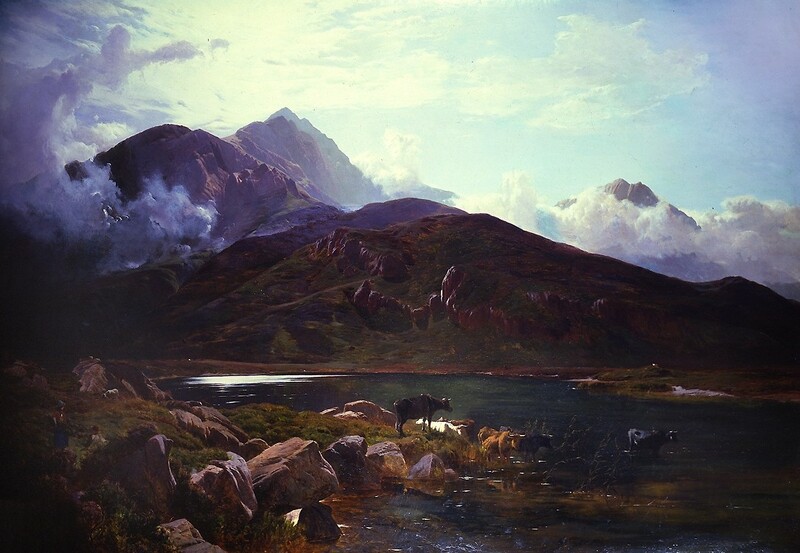 38 at the National Institution of the Fine Arts Exhibition at the old Portland Gallery on 316 Regent Street, London. 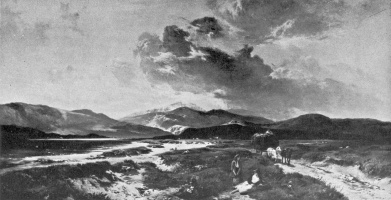 The Illustrated London News (March 29, 1856, p 320) wrote that, "'A Storm Gathering on Cader Idris, by S.R. 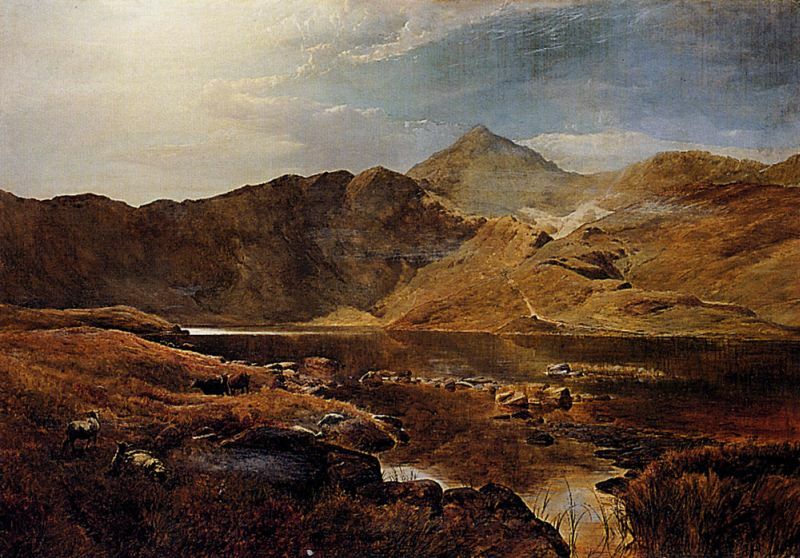 Percy is a bold and powerful study - darkness prevailing over the canvas, but broken fitfully with dashes of light.". 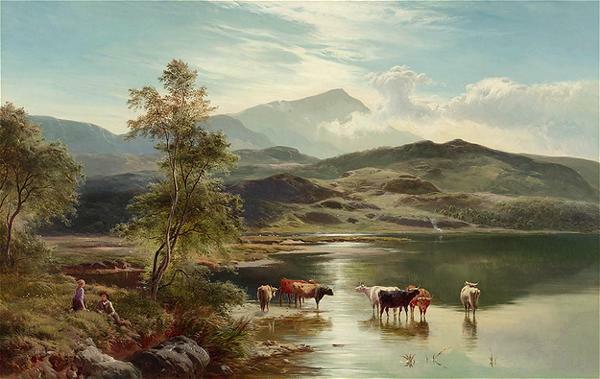 Also known simply as "Cattle Watering", this is one of the more popular Sidney Richard Percy paintings, judging by its wide availability on the internet as posters and prints. 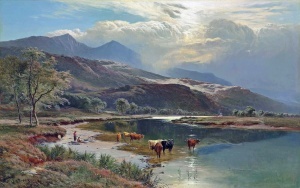 This painting shows the features that characterize Sidney Richard's paintings during the 1860s and 1870s - cows, clouds, and water, with a horizintal symmetry in which clouds, peaks, or a path dominate the center of the painting, and a vertical symmetry defined by a foreground of grass in the lower third, mountains and/or water in the middle, and sky above. 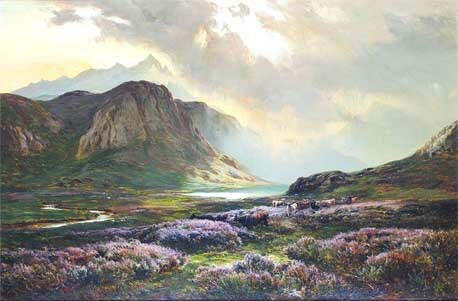 This is one of the more popular Sidney Richard Percy paintings, judging by its wide availability on the internet as posters and prints. 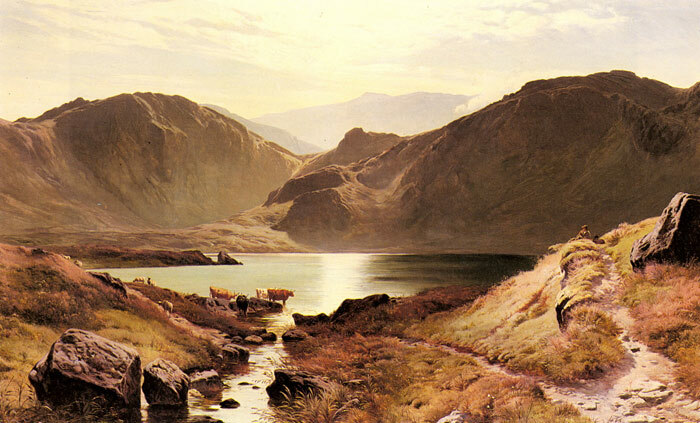 This time he paints sheep, instead of cows, and a seaside landscape, instead of the hills of Wales or Scotland. 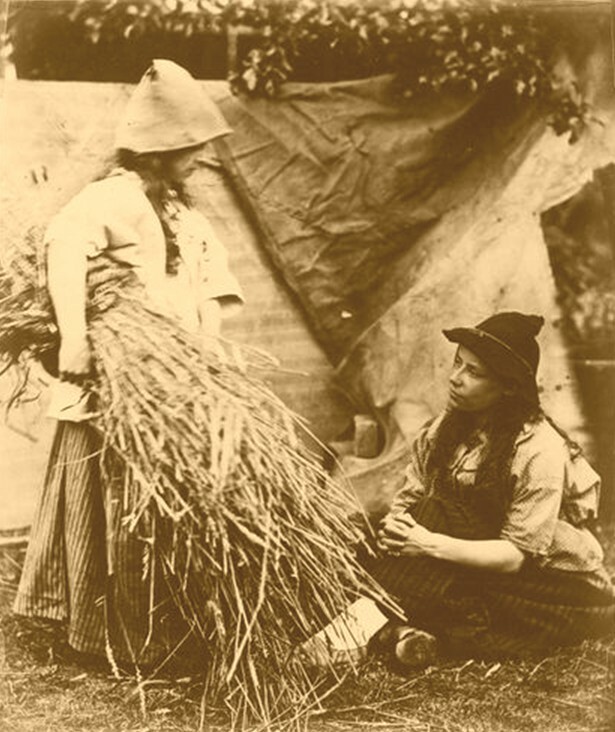 Sidney Richard Percy was a competent photographer, and he based many of the figures in his paintings on his own photographs, which often depicted gypsies he photographed on the outskirts of the Barnes and Wimbledon Common. 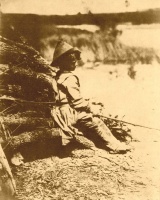 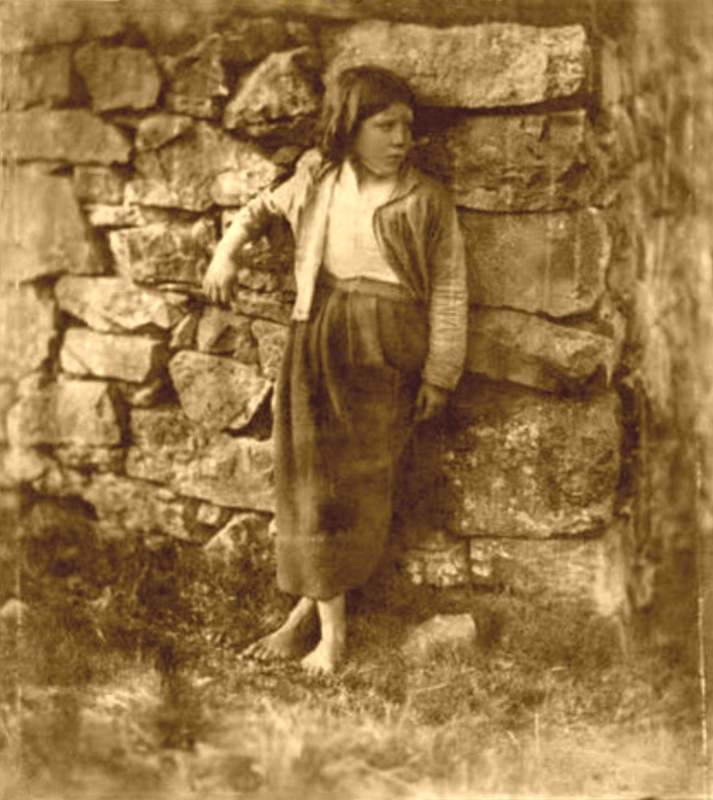 Compare the detail below from "A Rest on the Roadside" to Percy's photograph shown below. The same women appear in other of his paintings, including "Storm Gathering on Cader Idris", dated 1856, and "August...North Wales", which was painted 1862 and is shown below and left beneath the photograph. 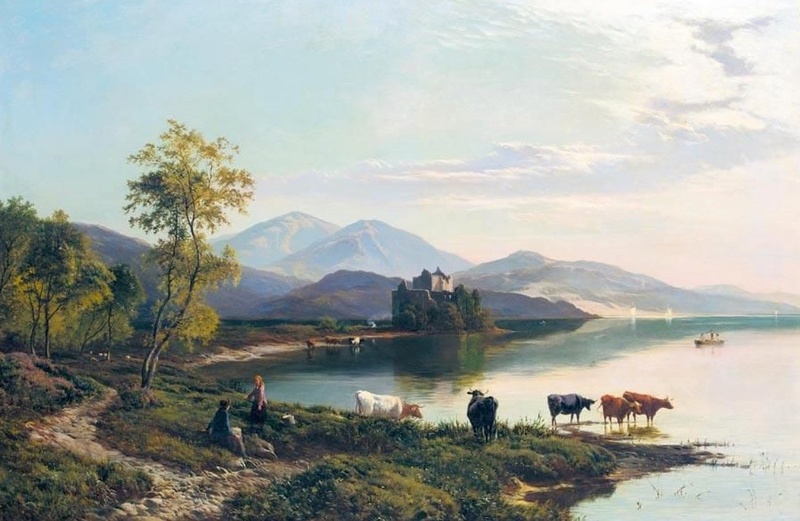 Note the similarity in layout between the 1861 and 1862 paintings. 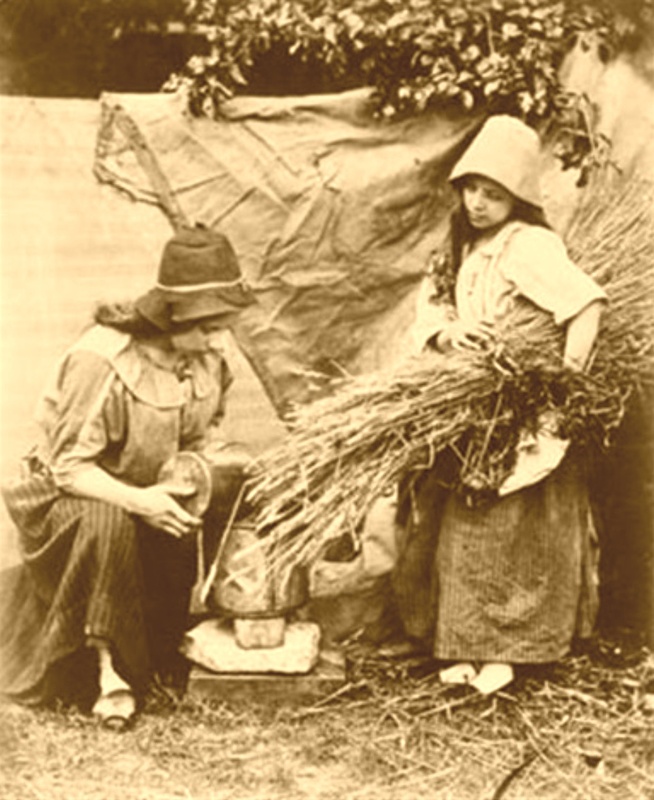 Variations on probably what are these same women appear in "Near Dolgelly" and "Mountain Lanscape with Figures and Cattle by a Lake". One of the more popular Sidney Richard Percy paintings, judging by its wide availability on the internet as posters and prints. 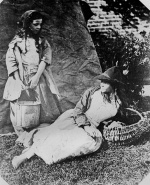 The two gypsy women shown in the photo above by Percy, appear in this painting as well. 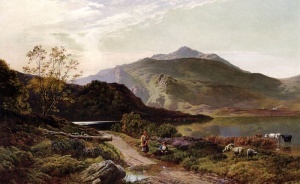 Percy almost certainly visited the mountain resort of Capel Curig in Snowdonia, Wales, as he painted several landscapes over the years of mountain views in and around the village. The example shown on the left was exhibited in 1864 as entry no. 421 at the Royal Academy of Art. 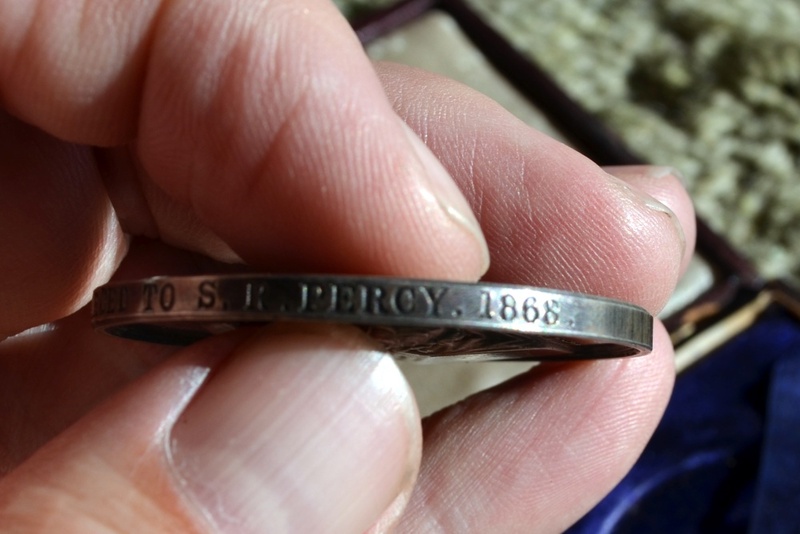 It is signed and dated S R Percy 64 in the lower left corner. 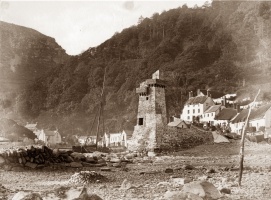 The example on the right, from 1873, is also signed and dated. 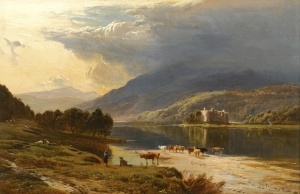 Two similar views of Kilchurn Castle in Scotland, but one dark and forboding, and the other sunlit with bright colors. 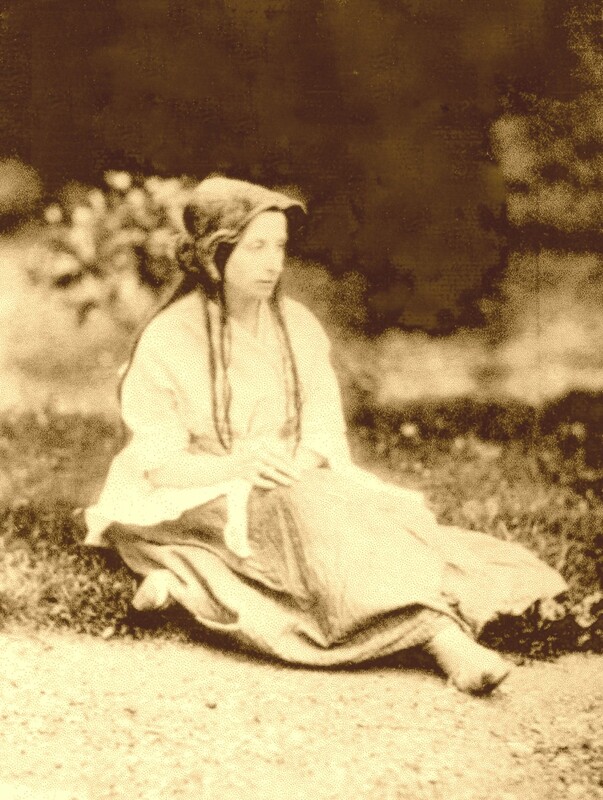 Exhibited in 1870 as entry no. 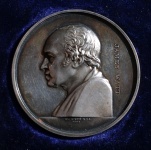 235 at the Royal Academy of Art. 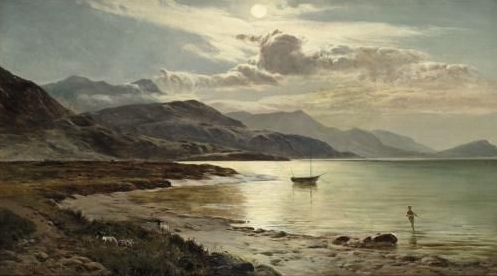 This painting is unsigned and undated, but various art dealers have dated it as 1872, 1876 and 1879. 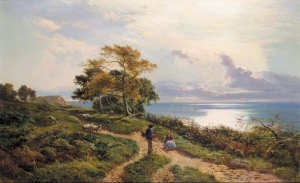 It was never exhibited and was probably painted on commission. 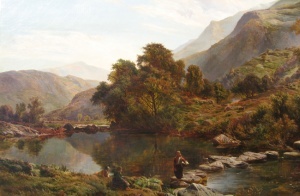 Although the figures in the foreground are typical of the style of figures that Sidney Richard Percy added to many of his paintings, the stepping stones in the creek is a theme used many times by Percy's brother Henry John Boddington. To see the similarities, compare this painting to Boddington's "On the Hills". 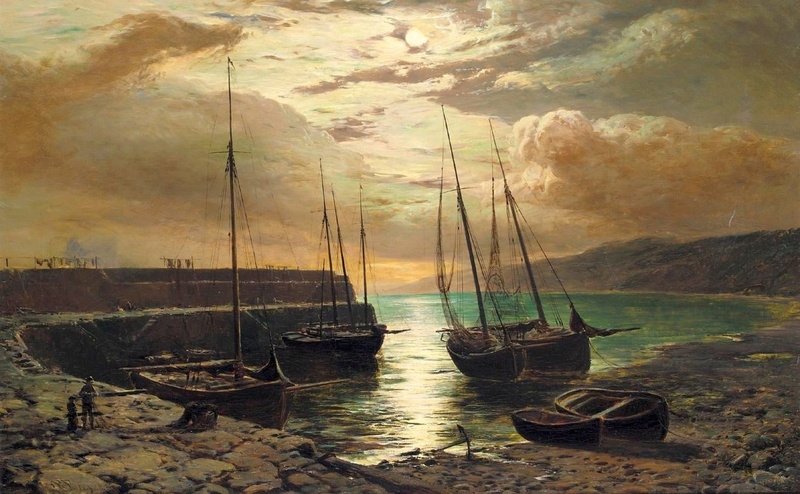 On occassion Sidney Richard Percy painted boat scenes. Exhibited in 1874 as entry no. 253 at the Royal Academy of Art. 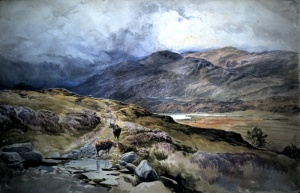 Sidney Richard Percy's fame and reputation as a landscape painter really began to grow after the successful 1856 exhibition of his painting "Storm Gathering on Cader Idris", and he painted several Cader Idris several more time in the years following this early success. This view of Cader Idris is one from 1874 when his painting career was probably at its peak. 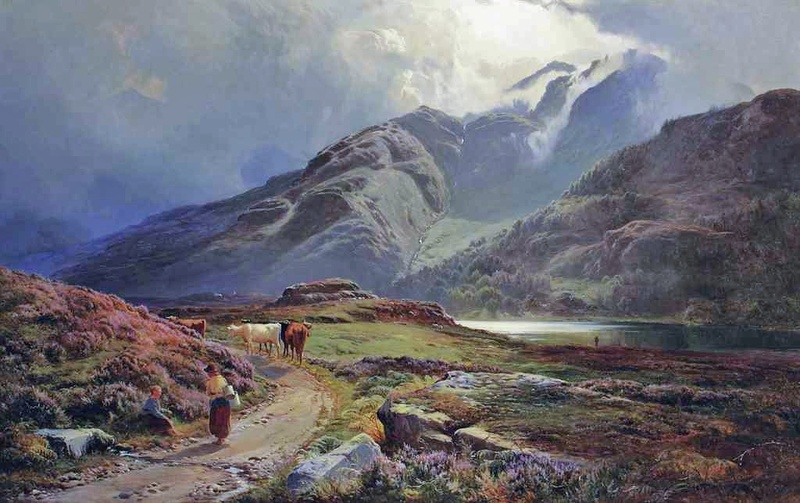 Sidney Richard Percy - After the Storm - undated. 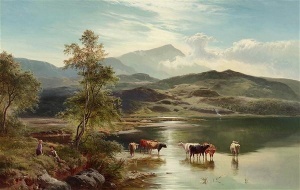 Another of the more popular of Sidney Richard Percy's works. In fact, it is probably the most widely available of all his paintings on the internet. It is undated, and was never exhibited, but the style is similar to some of his other landscapes from the 1870s. 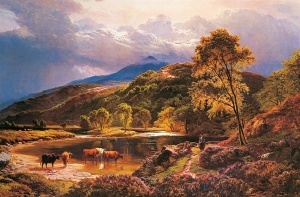 One of the more popular Sidney Richard Percy paintings, judging by its wide availability on the internet as posters and prints. 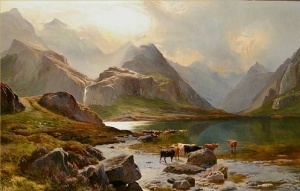 Llyn Dinas is a lake in the Nantgwynant valley in Snowdonia North Wales, and the mountain in the distance is called the 'Cnicht', but is also described as the �Matterhorn of Wales'. 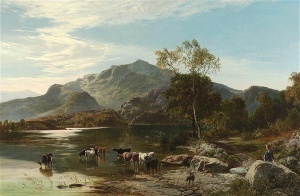 Percy first painted Llyn Dinas in 1853, and exhibited it athe Royal Academy the following year. 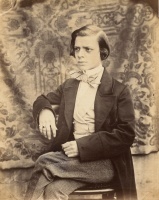 Another version was exhibited in 1864. 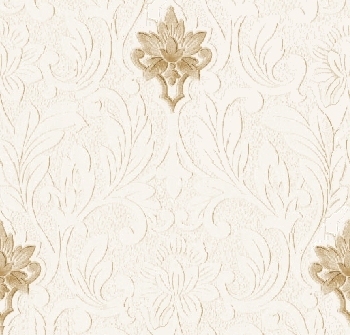 The colors of this 1875 version are more vibrant than the others, with greater symmetry of form. 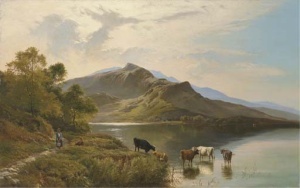 This picture and the one that follows shows Sidney Richard experimenting in his later years with different styles than the cow and mountains landscapes of the preceding period. Here the symmetry is at an angle with heather dominating the righthand slant, cliffs dominating the lefthand slant, and shafts of sunlight illuminating a highland loch that separates the two. Exhibited in 1883 as entry no. 162 at the Royal Academy of Art. 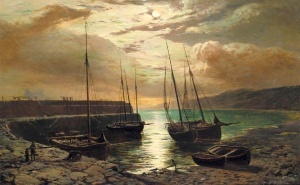 Sidney Richard Percy seldom painted boats, but this painting shows that he was equally at home painting scenes of the sea at twilight, as he was painting clouds and cattle. 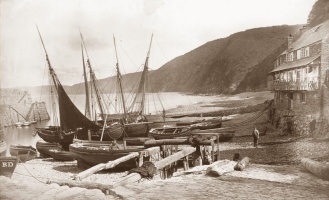 Shown on the right is a photograph that Percy took of a similar view of the harbor at Loch Scavaig. 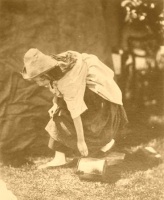 The watercolor on the left was passed down through Percy's family by his granddaughter Sidney Dolores Bunce, (neé Percy), and it may be an example of the type of painting that Percy's son Herbert Sidney Percy called "potboilers", which were simple watercolors on paper, quickly executed, and often sold on the spot, "to put food on the table". 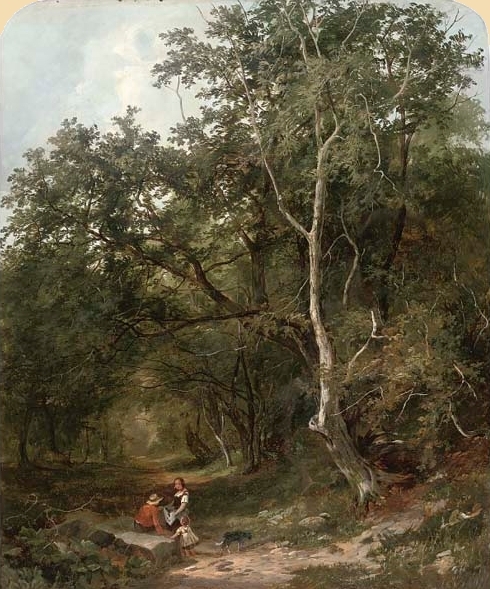 It may also be a field study from which a more carefully executed, oil-on-canvas, commissioned work was to be painted back in the studio. This watercolor in fact is quite similar to Percy's oil-on-canvas painting of "Blea Tarn", Westmorland" (1870), which is on the right. 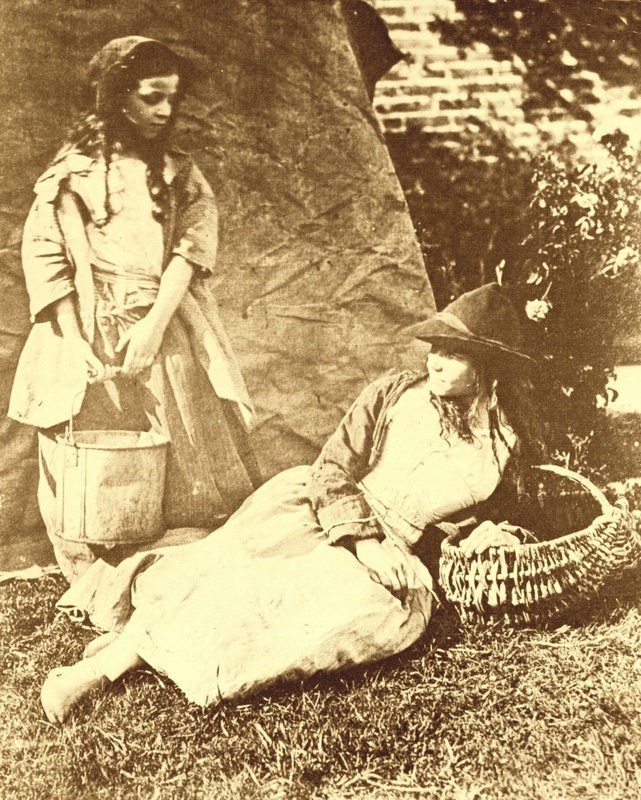 Sidney Richard Percy was a competent photographer, and he based many of the figures in his paintings on his own photographs, which often depicted gypsies that he photographed on the outskirts of the Barnes and Wimbledon Common. 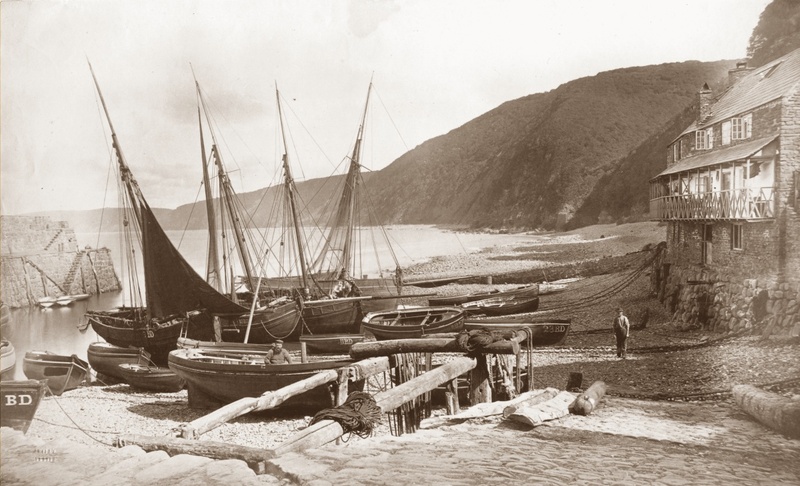 The draped wall evident in the upper row of photographs indicates that some of these scenes were probably staged, possibly even in Percy's own backyard. A prestigious 1868 First Class silver medal that he won from the Royal Cornwall Polytechnic Institute may very well have been in the Photography Section (II) for Amateur submissions of photographs. Family members photographed about 1870 by Sidney Richard Percy. 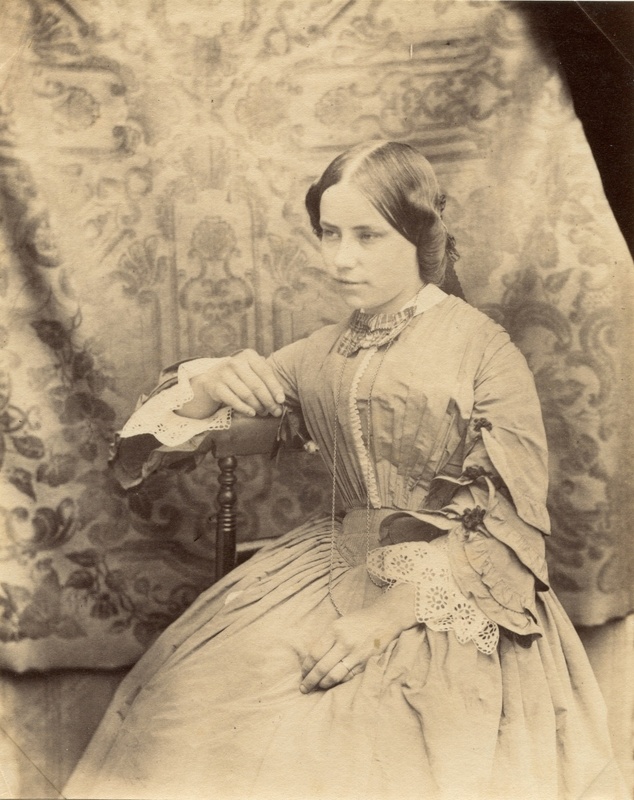 Note that the same background appears in all five portraits. 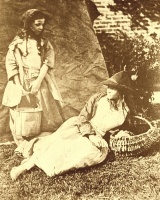 Maude Percy (daughter), and Clara Boddington (sister-in-law). All were probably photographed at Percy's home, on the same day.